This webinar will present a national program for Canadian diagnostic laboratories to compare DNA-variant interpretations and resolve discordant-variant classifications using the BRCA1 and BRCA2 genes as a case study. Erica Wellington holds a BA in Health and Society from the University of Rochester and an MS in Genetic Counseling from Brandeis University. She was previously a clinical genetic counselor at Perinatal Associates of Northern Nevada and then the Cancer Center of Santa Barbara. She has additional professional training through the City of Hope Intensive Course in Cancer Risk Assessment and Nevada LEND. 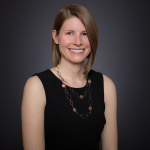 Erica is a member of the National Society of Genetic Counselors, and previously served as Secretary for the New England Regional Genetics Group and as Medical Outreach Director for the Down Syndrome Network of Northern Nevada. She joined Ambry’s Cancer Reporting team in 2016 and is active in both germline and paired germline-somatic reporting, as well as research projects.